I’ve had a chance to spend a week using this as my main Mac keyboard in alternation with my Cube G4 desktop machine and my PowerBook G4 when it’s sitting on its Griffin iCurve. The Matias USB 2.0 keyboard features a USB 2.0 dock built in to it. You can plug anything from your digital camera, iPod, USB memory stick or any other Mac compatible USB device and get the full 480Mbps transfer rate directly from this keyboard. This is unlike other keyboards that feature USB ports, which usually only contain USB 1 ports. The port is located just above the function keys and with a further two USB 1 ports on the top edge, the possibilities are unlimited for what you want to plug in. It’s certainly the first keyboard I’ve ever come across that has a powered USB 2.0 dock on it. With the many USB devices that are on the market today, it only makes sense to place these ports as close to the user rather than having to reach for the ports on the computer itself. So how have Matias managed to do this? Quite simple really, the cord that comes out of the keyboard splits in to two USB cables. If you only plug one in then you will only have access to the USB 1 ports but not the USB 2.0 dock. 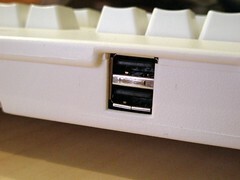 If you’re using the keyboard with a USB 1 computer (like my Cube G4) then it defaults to a dedicated USB 1 port but does have a power feed to it, unlike many other keyboards with the USB hub. The first time you plug this keyboard in, you are prompted with a quick and simple setup just to acknowledge that everything is working, as it should do. That just about covers all the plug and play features of this keyboard. In terms of the overall look and feel of this keyboard, you can’t go wrong. It’s different to what a lot of other keyboards feel like on the market today. First of all it’s very light. 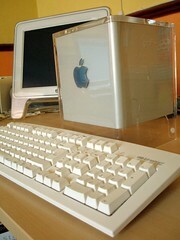 A lot lighter than the Apple Pro keyboard that came with the Cube – that weighs a tonne compared to this. When you pick this keyboard up, theirs really nothing to it. Stability issues I hear you say? The rubber feet keep the keyboard stable so it doesn’t move about when you’re hammering away. The Matias keyboard has that perceptible feel reminiscent of more old-fashioned keyboards. Most keyboards on the market today have a soft response and feedback. However Matias have deliberately gone for a high quality rubber dome material that sits under each key providing that tactile feel. Its meant to provide a little resistance to each key press so that it can hold the weight of your hands but also reduce long-term fatigue. In fact I’m typing this article on the very keyboard that I’m writing about and I have to say, I’m able to type just that little bit quicker compared to the Apple Pro keyboard. One complaint about the Apple Pro keyboard is the slowness of response from the keys. The feedback from the Matias keyboard is so much quicker that I can move from one key to the next without delay. I think that’s to do with depth of the keys. I can clearly press these keys in further and they spring back up very quickly. Thus offering fast and tactile response just as Matias promises. Excellent for a touch-typist as well as the two-finger-hammer style that many of us have. The print work on each key is clear and very detailed. Most of the keys have at least three symbols printed on them. You might think this is confusing but it’s not. The main symbol that the key represents is clear and you can’t mistake them. Keys such as the number 2 has the @ sign, TM and Euro signs printed on it. You can access any of these three keys by using the Shift key, Option key, and Shift + Option keys. 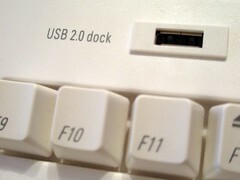 The usual Mac keys are also in place such as the Eject button (placed as a secondary key to F12), Mute, Volume up and down keys (placed above the Help, Delete and Page up, Page down keys). Caps lock is in a strange place. It’s located on the right hand side next to Control. The usual Caps lock position has been taken over by the Control key. This is a great feature! I love it. When using the Apple Pro mouse you only have access to one button and OS X is designed to work like that, however on the occasions. One thoughtful feature I discovered was the inclusion of a Tab key on the number pad. This means when you’re tapping in figures on a spreadsheet or web site you can just tab from one section to the next using the one hand. At $30 US dollars, that works out at about Â£18. A fantastic price for a high-quality, durable keyboard with built in USB 1 hub and USB 2 dock. This fully featured keyboard with a well thought-out layout and simple set up would make an ideal replacement for your Mac keyboard or a perfect match with your newly purchased Mac Mini. You can get the keyboard in White or Black. The black version for some reason is the only one that will work on Windows and Mac whereas the White model works exclusively on Mac only.